Readers will easily find Cartan’s biographies in the literature. Here we highlight some of his work and put it in context. More precisely, we set up to make the case that Élie Cartan (not to be confussed with Henri Cartan, who also was a mathematician) is possibly the greatest human mind in the mathematic/scientific area to ever walk this earth, way above Archimedes, Newton, Gauss and Einstein. We shall make our point mainly by combining authoritative opinions from mathematicians on different areas; nobody is in a position to emit such opinions on all the areas in which Cartan was involved. Some of this great contributions were buried as introductions to technical papers on subjects of lesser fame. For example, Ricci and Levi-Civita wrote a book on the tensor calculus in 1900; in 1899 Cartan published his creation of the far superior exterior calculus -recognized only in recent decades- as an introduction to a paper “About some differential expressions and the Pfaff problem”. A mathematician would have got his name in the history of mathematics just for creating this calculus, since, as Dieudonné put it, it is now the basis of differential geometry and of the theory of Lie groups. Through its use, he showed that the study of a space at the infinitesimal level can give information about its behavior in the large. In other words, he created a tool not only for differential geometry, differential equations and Lie groups, but also for global geometry and topology. Let us proceed systematically. Our starting point will be the classification that has been made of his work into three large areas: algebra, differential equations and geometry. “There is strong evidence to indicate that most main algebraists of the time, such as Gordan, Capelli, Hermite, Cayley, Silvester and even Hilbert … did not realize the sweeping extent of Grassmann’s discovery and its relevance in invariant theory. We shall later speak of his work on integral invariants. In view of that, does he not qualify as the greatest algebraist of his time? “After thinking about this method for another twenty years and talking periodically with S.S. Chern and my students, especially Robert Bryant, I realized … One may wonder why anyone would need twenty years to understand a paper. However, I was not alone in experiencing difficulty with parts of the theory of Repere Mobile and the method of equivalence, as the following two citations testify. The first is by Hermann Weyl  in his review of Cartan’s book . We now resume some of the principal formulae in coordinate notation with the idea of providing a partial glimpse to some of the writings of E Cartan on the infinite groups and on the equivalence problem. We must confess that we find most of these papers extremely rough going and we can not follow all the arguments in detail”. I am sure that most experts will consider Cartan as the greatest in this field . Third area: differential geometry. Here we touch the sublime. Let us start with these words by Hermann Weyl in 1938. “Cartan is undoubtedly the greatest living master in differential geometry.” Why: Cartan reinterpreted, unified and generalized the programs of Klein and Riemann in geometry. Using his discoveries on group and algebras and on the integrability of differential systems, he created the theories of affine, metric, Euclidean, projective, conformal connections, etc. He indeed showed how all other efforts in geometry fit into his scheme. In the process, he gave the differential form of Euclid’s postulates in spaces of any number of dimensions. He also authored the most important paper in Finsler geometry, which gave rise to the connection now known as the Cartan-Finsler connection. He created the concept of fiber spaces. In fact he worked with them since very early in his professional life, and it took half a century to really understand the concept. Physicists have not yet understood his view of how Riemannian geometry is to be seen, namely as pertaining to finite Lie groups rather than the infinite group of coordinate transformations. This is why they fail to see how gravitation (which they incorrectly associate with the infinite group of diffeomorphisms) has to be unified with the other interactions (associated with finite Lie groups). Cartan had the global vision of mathematics that allowed him to say what was wrong with other people’s programs and have the perspective and authority to use the term “the false spaces of Riemann” (he proceeded immediately to speak of their redemption by Levi-Civita). That global vision is implicit in the closing statement by S-S Chern of his introduction as Editor of “Studies in Global Geometry and Analysis”, statement which reads Geometry, topology and analysis are now indistinguishable. It was Cartan who made that possible. But this is only an understatement. 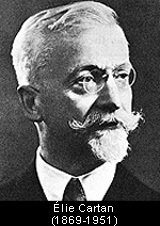 Because he was so great in algebra, Cartan was unique in the theory of exterior differential systems, which, in his work, is so firmly anchored in algebra. Again the depth of his work on differential systems is shown by his awsome contributions to classical differential geometry using precisely his profound knowledge of the theory of exterior differential systems. This point has been totally lost on most modern geometers. Result: even technical books fail to give nice examples of spaces with torsion, in spite of the fact that there are very simple examples (one of them given by Cartan himself in 1924). We now provide a couple of examples of this from his book on integral invariants. In the length of two pages after his statement of the concept of Lie operator (which he calls infinitesimal transformation) acting on functions, he extends the concept to the ring of differential forms, explains the impact of the concept for obtaining first integrals, gives two ways in which that operator generates new differential invariants from a given one, relates those two and produces in the process formulas to generate those invariants. Consider next, the inverse of Poincaré’s theorem. There are several proofs of the inverse theorem. They are several pages long. By a most original method, Cartan gives a one page proof of the inverse theorem, which includes a method to construct the differential form whose existence proves the inverse theorem. It is obvious that, for whatever reason, very few have read even small parts of Cartan’s work. Although the work by Cartan in physics is just a very tiny fraction of his work, we shall expand on his work as physicist technician, given the expected readership of this website. In the same book on integral invariants, Cartan provides a wealth of applications to fluids, optics, rigid body dynamics, many body problems, standard issues in the foundations of classical mechanics (like generalizations of the theorem of Poissn-Jacobi and of the Poisson-Jacobi brackets). The pace is dizzying. Section 1 in the book starts by obtaining the equations of motion from the variational principle. By page 4 he has already obtained the Hilbert integral and by page 7 he has derived the equations of motion from that integral. Consider the application of Lie operators to the n-body problem with standard potential energy where the exponent of the radius in the denominator is left undetermined. After obtaining 11 differential invariants (whose integrals are integral invariants, one of them resulting in the Jacobi integral), he obtains from them a wealth of first integrals and the theorem that states the invariance of the product of the square of the angular momentum and the total energy, both in the movement around the center of mass. And he does all that in four pages, which are barely enough to write down his results. Similarly he takes just one page to obtain from first principles the invariance of the magnitude of the velocity of the points in a moving rigid body. He treats fluids like part of classical mechanics, i.e. following the particles in their motion; results emerge in quick succession. His results on mechanics in his book on integral invariants would constitute a fitting sequel to Landau and Lifshitz book on this subject. One could retort that one can always write very concisely if one simply does not provide intermediate steps. The only problem with that remark is that Cartan wrote about a dozen books and almost 200 papers, the latter ones comprising more than 46 hundred pages. If the professional life of a scientist or mathematician were compared to the running of the marathon, Cartan sprinted for all the 42 kilometers. Cartan the physicist . If Cartan had been studied and understood, he would have been considered a great physicist. Most relativists still do not understand the conservation law of vector-valued forms, although he gave it in his 1922 on Einstein’s equations (This is of particular importance in cosmology since integrations of vector-valued quantities do not make sense under the Levi-Civita connection, which does not allow path-independence identification of the tangent spaces at different points; if one still obtains good results when performing integrations, it is so because a metric together with a preferred frame detemines a teleparallel connection, which means that cosmologists, without knowing it, are using a teleparallel connection determined by the metric and the frame of reference comoving with matter at the largest scales). Take electrodynamics. Just his discussion of electrodynamics in a few pages of his 1924 paper (second in the series) on the theory of affine connections supersedes by far similar work in a paper of 1934 by Van Dantzig presented by Dirac and published in Proceedings of the Cambridge Philosophical Society. In those few pages Cartan discusses what is the right way of writing Maxwell’s equations, whether these equations depend on connection and whether electrodynamics itself (there are the energy equations in addition to Maxwell’s) depends on connection. He even gives the form of the electromagnetic energy-momentum tensor in a kind of Kaluza-Klein space that he introduces in an informal way. In fact, in 1923-1924 he wrote all the fundamental physics of the time (except the emerging quantum mechanics) in terms of differential forms, which imply the emptiness of general covariance as a general principle (it is just a heuristic help). But this potentially greatest contribution to physics is still to be realized if and when the Cartan-Einstein unification that this web site documents were to become one day the theory that every one is seeking. Indeed, Cartan already explained to Einstein (but the latter did not understand) the difference between formulating a geometric unified theory as a physicist and as a demiurge. To be a demiurge means that one demands of its field equations that they prove that the universe is what it is postulated to be, and not just consistent with the postulate. In the case of teleparallelism (TP), it means that the field equations must imply TP, and not simply ignore the affine curvature because it is zero. Cartan did inform on this to Einstein (and actually proposed him a couple of equations in this regard!, which we rediscoverd independently), but the latter did not listen. The irony is that, in the purest form of demiurgism, one takes the equations of structure of some space and makes them become the field equations of the physics. But that is precisely the best possible implementation of Einstein’s thesis of logical homogeneity of geometry and theoretical physics. And there is more. In developing “demiurgic TP”, these authors have encountered precisely energy-momentum tensors as bivector-valued differential forms in a 5-dimensional space, which is precisely the form of such tensors in Cartan’s work of 1923-24 for no known reason. In physics, Cartan may have been even furthest ahead of his time than in mathematics. We have tried to size up Élie Cartan. He reaches far beyond the clouds. Nobody can see his head and feet at the same time. We did what we could. We feel the great honor of having had the opportunity to do so. In his day job, Hermann Grassmann was a high school teacher. In his space time, he became one of the greatest mathematicians of all time. In addition, he was a superb linguist who translated the Hindu Rig Veda (literature and religion) from Sanskrit into German verse, and produced an extensive dictionary in the process. He was an accomplished folklorist, musician and natural scientist (botany, crystallography, color mixing, statics, electricity, acoustics, theory of tides, invented a heliostat, etc). He undertook six semesters of university studies in Berlin, his subject being philology, theology, philosophy and psychology. 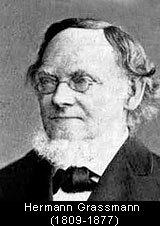 Reportedly, he did not take any mathematics courses there, but read books in mathematics written by his father, Justus G. Grassmann, another high school teacher. In fact, the idea of purely geometric products, which are the basis of H. Grassmann’s mathematical work was his father’s. Hermann developed Justus’es basic concepts into a full blown system. He passed several state examinations which qualified him to teach a variety of subjects in high school. He was eventually granted a Doctor of Philosophy Honoris Causa by the University of Tübingen. He was elected a corresponding member of the Göttingen scientific society. After his death, he was finally recognized by Felix Klein and Sophus Lie, who was instrumental in the publication of his Complete Works. In mathematics, Grassmann is best known for conceiving and developing exterior algebra. By 1844, he was dealing with mathematical objects of arbitrary dimensions (hyperplanes) living in n-dimensional space, for arbitrary integer n. This is presently known as graded algebra, where there are scalars, vectors, bivectors (antisymmetric tensors of grade two), trivectors, etc. He did that ten years before Riemann’s famous lecture to the Göttingen faculty on the spaces that now bear his name, at a time where one barely had addition of vectors and multiplication by scalars. Highly recognized nowadays also is his implicit contribution to projective geometry, with implications for differential topology and algebraic geometry, and where the concept of Grassmannian honors his name. The exterior product was, however, only the most relevant of the sixteen different products that he considered. Cartan singles out a few types of them: the symmetric, the circular and the linear products. The latter is not to be confused with the inner product, which was originally called linear and which is a particular case of circular (another one is the complex). Among the linear ones, Cartan singles out as most interesting the algebraic (satisfying ) and the exterior (), where and are units of bases in the respective systems. In the exterior system, Grassmann considers two types of products, progressive and regressive. He was dealing for the first time in history with multivectors, quotient algebras (implicitly), graded algebras, non-commutative algebras, etc. Grassmann did not use the vector product, which is a contraption peculiar to three dimensions (also seven dimensions in a more artificial way). The vector product comprises the exterior product which is then followed by another operation (Both the exterior and vector products of two vectors have the same components, though the exterior product is not of the same nature as the factors). This is so because he rightly embedded the vector calculus in graded algebra, but said calculus was there is any case. His 1840 study of tides constitutes the first major use of vector analysis, though he called “extensive quantities” what nowadays, following Hamilton, are called vectors. His extensive use of associative, distributive, commutative and anticommutative laws was totally uncharacteristic in his time. Yaglom reports that Dedekind develop the axiomatic definition of the natural numbers from Grassmann’s constructions. Just before dying he came to the thushold of Clifford algebra. The Clifford product of two vectors is the sum of their exterior and inner products, which Grassmann created. (He had abandoned mathematics during the previous ten years because of frustration with the lack of reception of his ideas.) The dust has not yet settled on what was the vision on projective geometry. The paper by Dieudonné The Tragedy of Grassmann, where the latter’s contribution to that geometry is lauded, was eventually followed by Rotte and collaborators who claim that the Bourkakists (Dieudonné is one of them) had not understood the full import of Grassmann’s ideas on the subject. That is ironic since both of these parties may lay claim to being the greatest modern admirers of Grassmann. Reportedly, Cartan’s work is difficult to understand. Grassmann work is much more so. This should not be surprising. In addition to being ahead of his time and working in total isolation from academia, he was not trained in the prevailing mathematical traditions. Top mathematicians like Gauss, Cauchy and Möbius were put off by his style, thus failing to capture the tremendous depth of his ideas. See also Cartan’s “biography” [LINK] in this site for comments about modern algebraists who failed similarly, in spite of the advantage that the passing of time confers. One has to wonder what might have been Grassmann’s legacy if he had been offered a professorship at Göttingen to develop and explain his ideas in a more conventional way. A terrific cross-fertilization with Gauss and specialize Riemann might have ensued before the “horrible vector calculus” (Dieudonné’s expression), tensor calculus and gamma matrices emerged. The calculus and geometry might have been at the beginning of the 20th century better than they are today. M. Barnabei, A. Brini and G-C. Rota, On the Exterior Calculus of Invariant Theory, J. of Algebra 96, 120-160 (1985). M. J. Crowe, A History of Vector Analysis, Dover, N.Y., 1967. J. Dieudonné, The Tragedy of Grassmann, Linear and Multilinear Algebra 8, 1-14 (1979). I. M. Yaglom, Felix Klein and Sophus Lie, Birkhäuser, Boston, 1988.